I could not be happier with my higher percentage F4 savannah boy that I got from Lynda. Finding a savannah with great temperament was very important to me. 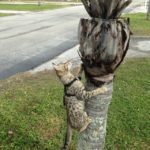 I also have an early generation F2 bengal so I wanted another high energy exotic cat to keep up with her. I had no idea what to expect considering I had a biased bengal view of savannahs. My girlfriend and I immediately fell in love with Cheetoh when we got him. Not only did he have that very wild-looking savannah look with a gorgeous facial profile of high cheekbones, massive radar ears and sleek triangular face but he also had the sweetest savannah temperament. He is an extremely affectionate cat who is a purr machine and constantly rubs his head and neck against us (aka a savannah headbutt). He loves to play and has never gotten aggressive with anyone he’s met and is a great companion who always loves to be around people. 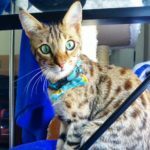 I wholeheartedly believe that all of Lynda’s savannah cats have similar temperaments considering she puts in a great deal of time in ensuring her kitties have well-tempered parents. I believe that she does the necessary steps in making sure the kitties get enough attention as well. Her blood lines are also top-notch quality so you’ll know that your savannah will have a stunning look to them too. I really don’t think you can get better quality kittens for a great price as well!